Minimum 1 year Diploma in Multimedia Course with experience o 2D/ 3D animation. Candidates need to attend the interview on the given date along with update Bio-data and attested testimonials. 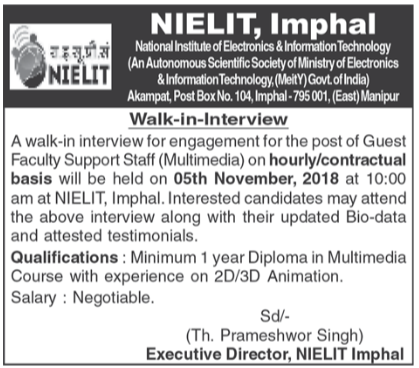 Venue of Interview: At National Institute of Electronics & Information Technology, NIELIT Imphal. Previous story Indian Veterinary Research Institute Walk in Interview Nov 2018 For SRFs Posts.